What do we know about Adolfo. He left for the USA after the death of his father in 1903. He and his brother Giuseppe also visited Scotland as is seen below. when he is photographed in Edinburgh with his brothers Giuseppe and Augusto. 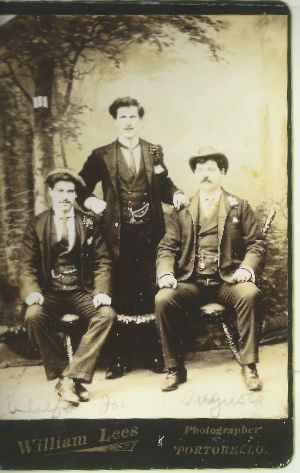 Three Quilietti brothers – photograph taken in Portobello, Edinburgh. Adolfo, Giuseppe and Augusto. Emilio’s wedding maybe or perhaps as Emilio is absent from the portrait this was taken after his death in 1898. During this visit to Scotland Giuseppe and Adolfo met up with Emilio’s children and the young Valentina Quilietti became close with her uncles. It was in fact her who forwarded these photographs to the USA after the re-marriage of her mum, Valentina Brattesani Quilietti, to Sante Brattesani who was her mum’s first-cousin. The story goes that she rescued them from the bin and forwarded them to Rhode Island. It is thanks to her today that we have these very precious images of the Q family back then. 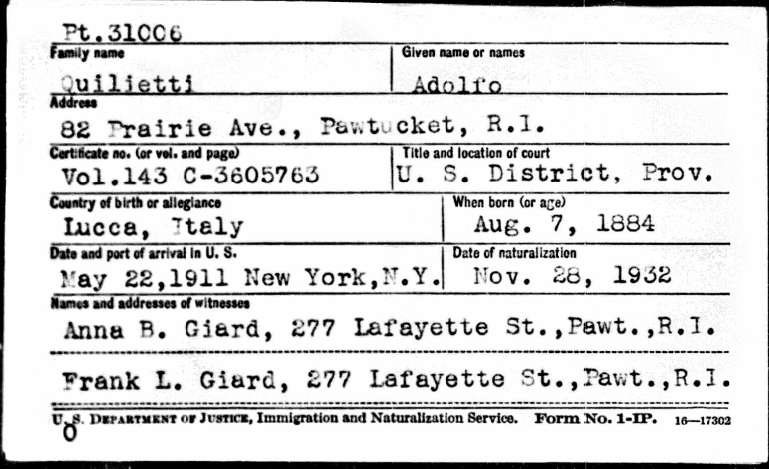 Searches today tell us that the brothers Quilietti travelled many times between Italy and Rhode Island before finally settling in 1911. 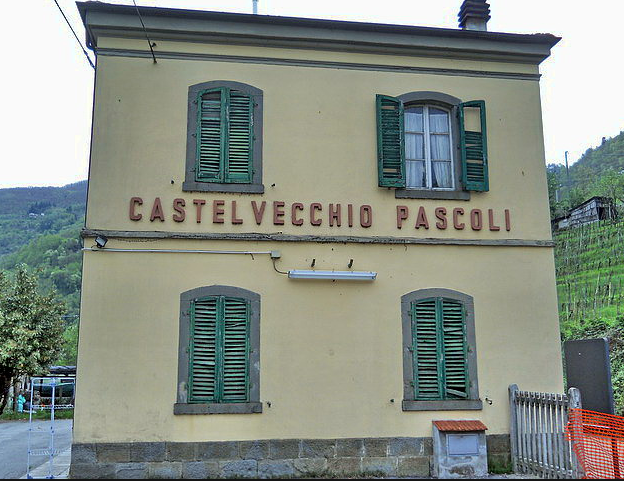 In 1910 during one of their visits they were documented as staying with their sister Ermenia Quilietti and her husband [and cousin] Peter Dante. Another bit of nonsense to make comment on was why in the year 1907 when they travelled between the continents did Joe travel 1st class and Adolfo 3rd Class . 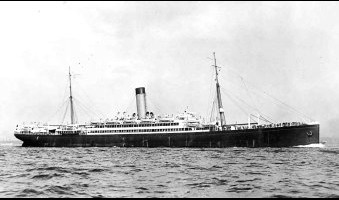 1st and 3rd class – year 1907 – Ship Canopic – she sailed in January of the year when the Atlantic Ocean would not have been kind to these two brothers. However Joe had his comforts in the upper floor of the ship. 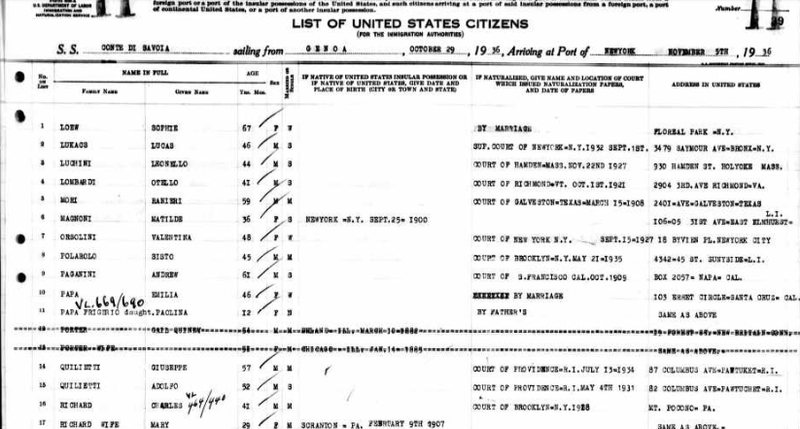 The interesting thing about the 1910 census tells us that the Quilietti brothers had first emigrated in 1906 even although they visited twice before this date. It also tells us that they were both working as Machinists and living with their sister and brother-in-law Peter Dante. 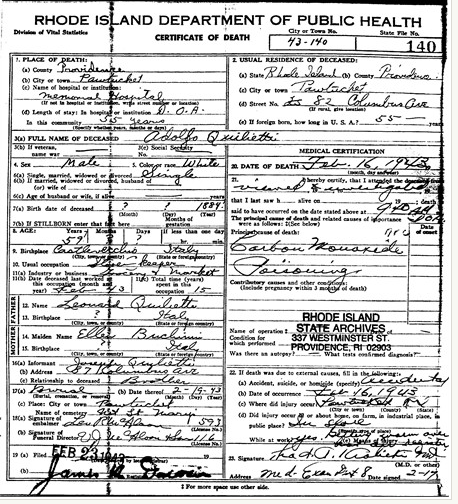 Peter as we are aware emigrated with his parents in 1889. His mum was the sister of Eletta Brucciani Quilietti. 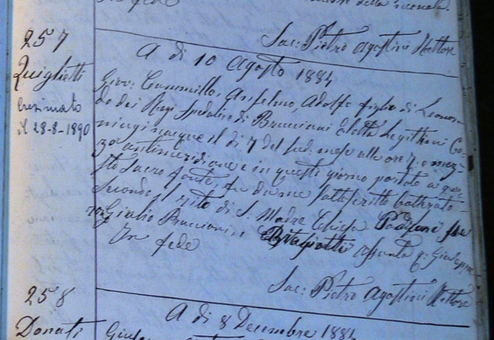 Ermenia Quilietti followed in 1899 as is documented below. 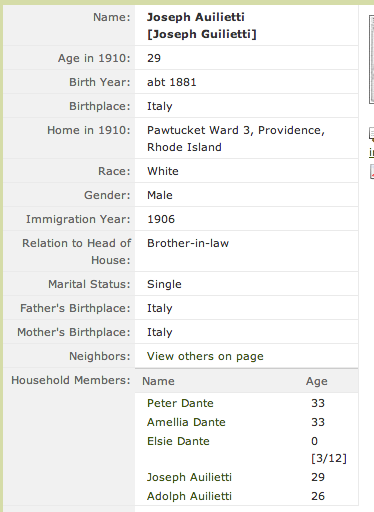 She married her cousin Peter Dante in 1901 in Pawtucket. another version. 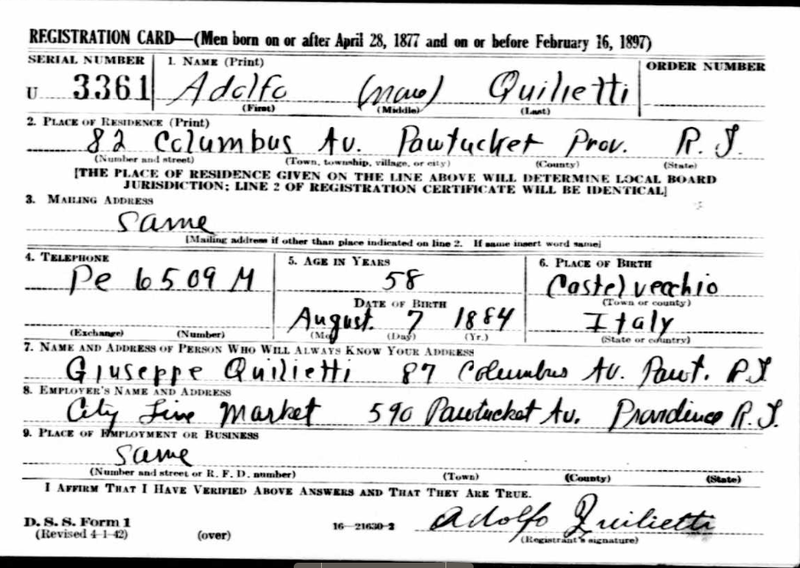 I love this one as it is handwritten with Adolfo’s signature as well with the Q in its beautiful original hand as is shown above on his birth register. They also returned back to Italy on many occasions and here we find them returning from the Port of Genoa in 1936. Augusto and his brother Giuseppe or Joe lived out their lives in the Meat Processing Business in Pawtucket in Rhode Island. Their store was typical of the time selling fresh fruit and vegetables which stood outside the shop in a wonderful display of colours. Joe married and the brothers ceased to share the same house for a while. Adolfo remained a bachelor although he was never without companions. His photograph above shows how dashing he looked. There are many stories about Adolfo and his girlfriends. But a bad accident involving carbon monoxide took his life when he was only 59 years old. 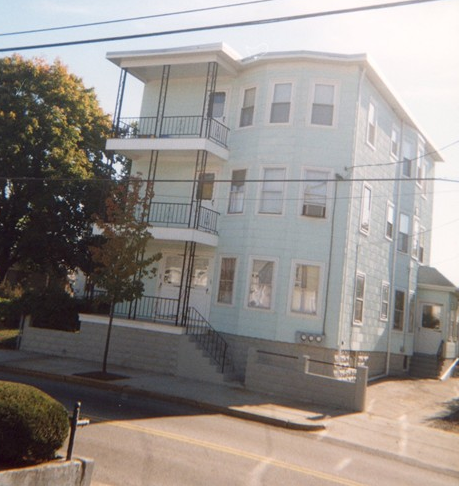 He is buried in Mount St. Mary’s Cemetery in Pawtucket. Ever since the sacred body of Jesus Christ was reverently laid in a tomb, the Catholic Church has respected the profound goodness and loving mercy derived from the interment/entombment of the deceased. The Catholic Church has always taught that burial of the deceased is a Corporal Work of Mercy; seeing it necessary to dedicate solemnly, consecrated ground for this holy purpose. Catholic Cemeteries serve this purpose of burying the faithful departed, as to bear witness to Christ and to await the resurrection of the body into life everlasting. In an effort to adhere to these fundamental beliefs of the Catholic Church, the staff of Catholic Cemeteries works tirelessly to maintain the dignity and beauty of its nine properties.